Montage 2 is a choreography by Anna Koch. Performed by Simon Norrthon. Music:Ida Lundén. Light:Josefin Hinders. Premiered the 20th of Nov 2006. In Montage 2 Koch has carefully worked with the archive of movements that lies within the body of an actor. The choreographer and the dancer/actor has traced down movements that lies within past role characters. They examined when both character and movement "stuttered" or was repeated and asked the question: what is the smallest expression for an imprint? Anna Koch’s major focus of interest in her choreographic works is targeted on the feeling of presence that can arise in the interaction between action, perception and representation and on the body as the coordinator for memory and as a social archive. In Montage, she unpeels layer after layer, using a variety of perspectives. Spatiality is constructed, deconstructed and erased. Choreographic movements are filtered, re-presented and put together to form a new whole. Montage 2 is the second part of the triptych Montage. The first part was premiered in spring 2006. Has in the fall of 2006 been playing the role as Andy Warhol at the Royal Theatre (Dramatiska Teatern), in Stockholm. His extended experience reaches from working in both film- theatre-, television- and dance productions. 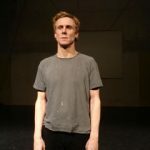 Norrthon has worked with choreographers such as Mats Ek, Birgitta Egerbladh and director’s such as Suzanne Osten, Stefan Larsson and Klaus Hoffmeyer.